2004 Léal Estate Carnavál Meritage. It’s unfiltered (I love unfiltered wine! ), silky in the mouth, leading to a lasting finish, firm but soft tannins, should age well for years. While I have a bit of a preference for their Cabernet, this meritage is complex and enjoyable…a favorite “every-day” drinking wine. And, a nice job at blending selections. Would highly recommend, especially for the cost, and I will undoubtedly purchase it again. 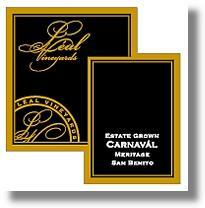 Leal Vineyards is one of my personal favorites. They offer a variety of selections, and, they are all quite simply delicious!